I was going to have a really cool tutorial for a sewing project today, but I failed miserably at it! Seriously, epic crafting fail. So, no sewing tute for today, but I will show you something else I've been working on! A paint chip pumpkin! I've seen tons of paper pumpkins on the internet, and with vibrant colors and stiffer paper, I thought paint chips would work perfectly! A simple and FREE craft! This next part is the trickiest of the entire project. Since the paint chips are so much stiffer than regular paper, they need a little help curving. Hold each end of the strip, and pull it tightly against the edge of a table. (In the picture I'm not pulling very tightly, it was just to show the technique.) Pull it back and forth against the edge of the table several times (ok, like 30-40 times, but it only takes a few seconds!) until the strip has a little bit of curve to it. This is what you'll end up with. See how they're nice and curved by themselves? Now to assemble the pumpkin! Make sure that glue gun is on! Take two strips and line them up perpendicularly. (You know, create a right angle using the two strips?) Dab a little bit of glue on them and stick them together. And the next one to get a cross shape. Once you have that, you need to attach the tops together. Working one at a time, glue each one together, still working with perpendicular strips. Tadah!!! You can leave it like this if you want, but I didn't want to see the bar codes and writing on the inside, so I added some more strips. I just added strips to the open sides of the pumpkin and glued them to the top. With the basic shape already done, this will be much easier. Huzzah! We almost have a pumpkin! I added a green star to it, and then realized that I'm making a pumpkin, not a tomato. Stupid me! Don't add a star! You do need to add a stem though. Cut a small rectangle out of the green paint chip (I'm talking a centimeter wide and an inch tall!) Fold it in half. Fold the two ends under, making a triangle shape. This just gives the glue something to stick to. Cut a thinner, longer strip of green and coil it around a pencil to get a spring like shape. Glue them both on and you're done! Make several more so your first pumpkin isn't lonely. Admire your new, FREE, fall decor! I have several more in the works with other colors and different styles of chips, so stay tuned for my own pumpkin patch! Happy crafting! :) I'm linking this up to all of my favorite parties that are listed here. Edited to add: Huzzah! There are more paint chip pumpkins out there! Amanda from the Paisley Cupcake also has a great tutorial for paint sample pumpkins! Edited to add pictures! : Seriously my friends, these are SO much fun!! I finished a few more, but I need to get back to my SILs birthday present. I experimented with different shades of orange. "Buttered sweet corn" on "Cinderella's dress." Aren't those the coolest paint names? It came out to this. It's one of my favorites, I wish I could show you how cool it is in pictures! My little pumpkin patch. They're now scattered all over my bookshelf! I love them, I smile when I look at them. Great idea - the paint chip addition is very clever! Oh paint chips... I may or may not dream about spending hours looking at paint chips. I am attracted to large displays of color. This craft is pretty cool. I absolutely love this craft. Definitely one I can try with the kiddos, and best of all it's free! I'll be linking back to you when I post mine! What a great idea! I've seen it done with scrapbook paper but this better cause it's free! I came over from New Friend Friday. I love love the idea to use paint chips, my favorite are the ones that show the lines in between the different shades of orange. Cute! 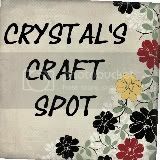 Thanks for sharing with us at A Crafty Soiree! Please join us next time too! Cute idea! What a great idea to use paint samples. cutest idea ever! love it! I'm so happy you found my little blog! I am a wife, a teacher, a crafter, and a home maker. I love to create, whether it is through sewing, cooking, painting or crafting. So relax, stay awhile! I hope you find something you like.